In this post we will consume ASP.Net Web API HTTP Service in Windows Phone Application. If you do not specify header information in HTTP request then by default ASP.Net Web API service returns JSON data. So essentially there are three steps involved in consuming HTTP Service from ASP.Net Web API in Windows Phone Application. I have created a Windows Phone Application by choosing target framework 7.1. We are going to display Bloggers Data returned from ASP.Net Web API service in a ListView. Essentially we are going to consume a JSON Data from a HTTP Service. For that add below references in the project. We are going to de-serialize JSON data using DataContractJsonSerializer class. We need to create a class at client side representing Bloggers entity from the service. Let us create a class called BloggersClient. We will de-serialize JSON data returning from the HTTP service in this object of this class. We are going to download JSON data from ASP.Net Web API service using WebClient class. Make sure that you are passing URL of your HTTP Service. Setting List of BloggerClient as ItemSource of ListBox. On the XAML we have put a ListBox with name lstBloggers. On the XAML, we have put ListBox control do bind data from HTTP Service in the control. Now press F5 to run the application. You should able to get Bloggers detail from ASP.Net Web API service in Windows Phone Application. Nice post. You may want to consider using the JSON.NET library and also not that there is not a need to use a MemoryStream because e.Result is a string already. Here would be a modified version of the code using JSON.NET and removing the MemoryStream. 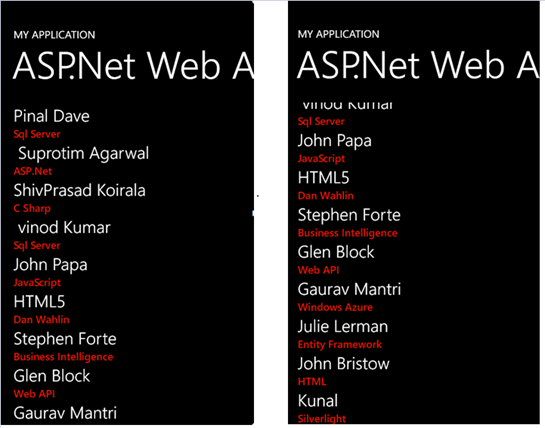 Does Self-Host ASP.Net Web API work on WP8(Windows Phone 8)?